Welcome to Palestine Today, a service of the International Middle East Media Center, www.imemc.org, for Wednesday, August, 16, 2017. Israeli clashes leave 26 injured civilians in the West Bank as the navy attack Gaza fishermen These stories, and more, coming up, stay tuned. Medical sources in Ramallah said the soldiers shot 26 Palestinians during the clashes; one of them is a cameraman, identified as Mohammad Radi, who works for Palestine TV. The cameraman was shot with a rubber-coated steel bullet in his face, after a soldier shot him from a close range, while he was filming the clashes. The sources stated that thirteen Palestinians were shot with rubber-coated steel bullets, and thirteen others suffered the effects of teargas inhalation. It is worth mentioning that the soldiers have recently abducted the parents, and uncle, of Omar al-‘Abed who carried out the stabbing attack last month. Also on Wednesday, Israeli soldiers abducted, four Palestinians in Abu Dis town, and one in at-Tour, in occupied East Jerusalem, in addition to abducting another Palestinian near Jenin, in the northern part of the West Bank, and three in Hebron, in southern West Bank. Elsewhere, Israeli navy ships opened fire, on Wednesday morning, targeting several Palestinian fishing boats near the coast of Beit Lahia, in the northern part of the Gaza Strip. The attack did not lead to casualties, abductions or property damage, but forced the fishermen back to shore without being able to fish and provide for their families. 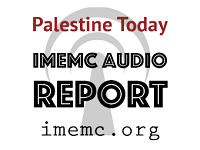 And that’s all for today from the IMEMC News; this was the Wednesday , August, 16, 2017, news round-up from the Occupied Palestinian Territories. From more news and updates, please visit our website at www.imemc.org today’s report has been brought to you by George Rishmawi and me Ghassan Bannoura.